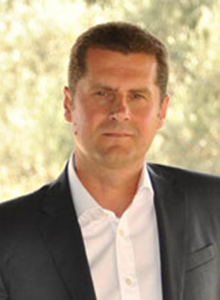 Michael Mavropoulos is the Regional Director East Mediterranean of TUI Destination Services a position held since April 2015, with responsibility for 13 countries including Greece, Cyprus, Malta, Turkey, Italy, Croatia, Bulgaria, Egypt, United Arab Emirates, Jordan, Oman, Israel as well as Iceland and Lapland. He started his career in 1988 at the hotel group Hilton, and held the position of Sales Manager in Athens and later in the United Arab Emirates. In 1996 he joined UPS in the Transportation and Logistics sector, where he held various international leadership positions in Saudi Arabia, Belgium, USA, and lately in Greece from the position of Managing Director for Greece and Balkans. He returned to the Tourism field, taking up the reins of TUI Hellas in June 2012. He holds a degree in Tourism Business Administration and an MBA from the University of Louisville, USA.